M​uriel Elaine Mann, age 91, died Friday, February 2, 2018 at the home of her daughter in American Fork from causes incident to age. She was with family at the time of her passing. 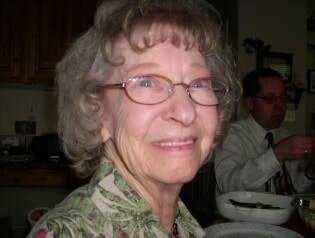 In hospice care for just two weeks prior to her death, Elaine passed away peacefully in her sleep. She is survived by her daughter, Linda Stucki and husband Mathew, granddaughter Camilla Hansen and husband Nick, grandson Steven Stucki and wife Carly, granddaughter Alyssa Lamb and husband Jerimiah, and granddaughters Amy, Melanie, and Emily, and two great-grandchildren, Mervin and Ozzy. Born 20 June 1926 in Denver, Colorado where her father worked in construction building the homes where they lived, Elaine spent her early years enjoying the Rocky Mountains. She was married in 1952 and later settled in Ventura, California when her husband accepted a position at Point Mugu Naval Base. Elaine was a California resident and worked as a dietician for the Camarillo State Hospital for most of her life before moving in 1996 to Orem, Utah to be near her family. She was preceded in death by her husband, Gayward Neal Mann, in 1972 and her sister, Thelma, in 1948 and brother, Elwood, in 2008. ​Surrounded by family, Elaine slipped from this life into the arms of her friends and family who preceded her in death. After more than 46 years, she has been reunited with her sweetheart Gayward. They spent many happy years together and are now finally back with each other. Certainly their reunion was sweet. Elaine spent nearly 20 years serving in the temple and was an avid genealogist. We expect that she has helped dozens perhaps hundreds of people on both sides of the veil. Now that her ill health is no longer a barrier, she will no doubt continue her service. She loved square dancing and participated in square dance clubs faithfully since she was a young woman at the University of Denver, where she danced in exhibitions at Red Rocks Amphitheater and Estes Park Barn in town and liked it very much. She tells the story that when she and her husband lived in Denver, that’s where she persuaded Gay to learn how to Square Dance. She convinced him to go to a Pot Luck Square Dance activity at the church where they were married. He went even though he said square dancing didn’t interest him and only attended to satisfy her. She promised Gay that they would go home after the potluck, but once the caller got them all into a large circle and taught some basic steps then put them in squares, Gay had the time of his life and could hardly wait until the following September to take lessons. They danced weekly or more and were favorites in their square dance clubs. They enjoyed square dancing all over California. Some of the clubs were the Barn Burners in Camarillo, the Bachelors ‘n Bachelorettes in Ventura, Grand Squares and the Outpost in Denver, Pi R Squares in Thousand Oaks, Jubileers, Alta Loma, The Mobile 8’s, Happy Squares in Semi Valley, Dudes ‘n’ Darlings in ​Ojai, Starliters in Point Hueneme, Marry Twirlers in Glendora, Ripsnorters in Camarillo, Trail Dusters in Woodland Hills, Road Runners in Santa Paula, T-Cup Chains and Square Hoppers in La Crescenta to name just a few. She also Round Danced with the club called Mission Rounds in Ventura and went to the International Dance Festival in Las Vegas and Dance-a-Rama in Salt Lake City. She earned the Crack Pot Badge, Rover Badge and the Sons of the Beaches for dancing on the beach or sand and many others. They joined a square dance club in Oxnard called the Romping Stompers and held all the offices in the club as Secretary, Treasurer, Vice President and President two times. They went to many parties and picnics in Ojai, had fun visiting other clubs stealing their banner so they would come visit their club to retrieve the banner, and many other activities. The couple always attended New Year’s Eve and Christmas parties with their square dance friends. Following Gay’s death, Elaine continued to dance faithfully in various square dance groups in California and later with the Mavericks in Utah. Elaine square danced for nearly 68 years. Elaine joined The Church of Jesus Christ of Latter-day Saints in 1980 and was sealed to her husband in 1985 in the Los Angeles temple. Family was always of upmost importance to Elaine, and all this she and Gay did with their daughter Linda, who continues to carry on the tradition of square dancing in her family today. Many knew and loved Elaine and a few were lucky enough to take a turn on the dance floor with her. We, her family, consider ourselves some of the most fortunate. I was born in Denver, Colorado and lived there until I married Gayward Mann. I went to the University of Denver and met my husband in a Zoology class. We both graduated the same year in 1948 and after graduation went our separate ways. I was accepted for an internship at Miami Valley Hospital in Dayton, Ohio, and Gay went to the University of Wyoming for graduate work in Chemistry. Being separated made the hearts grow fonder, and we decided to get married June 8, 1952. Gay wasn't happy with his profession and started night law school at the University of Denver. I worked at Presbyterian Hospital and then at the Colorado State Children's home as an administrative dietician for nine years, putting hubby through school. After his graduation from law school, he went into Patent, Trademarks and Copyrights law since he had a scientific background. We moved to Arlington, Virginia where he worked in the U.S. Patent Office as a Patent Examiner. It was in Washington D.C. that our daughter Linda was born. We moved from D.C. to Cleveland, Ohio and then back to Denver, Colorado and eventually to Ventura, California where he was a Patent Attorney for the U.S. Navy at Point Mugu Naval Base. Gay had a heart attack two years later and died Oct 9, 1972. I knew how to square dance long before I met Gay. During my college years at the University of Denver, I was in an Exhibition Square Dance Club called the D.U. Promenaders in 1946. We put on exhibition dancing in old mining towns such as Central City and Leadville and at the Red Rocks Amphitheater in Colorado. We wore long dresses and pantaloons like the pioneers. Some of the maneuvers we did were "Birdie in a Cage," which was popular in the 1940s, and "everything to the gals," swinging our legs out while holding on to the fellows' shoulders (I've forgotten the name now) while going around in a circle. It wasn't until 1966 when we went to a Methodist Church social, and the entertainment was beginning square dancing. Gay said he didn't want any part of it, but that changed quickly when we all got into a big circle and did "Do-Si-Do." He had so much fun he couldn't wait until September to join a class. From then on he was always on the dance floor. I think we were the ones who initiated the 'highland fling" instead of the back-to-back, and we also kicked high in the allemande left. At the first dance we attended in Santa Barbara, California, the caller claimed we made his needle jump so after that we danced at the back of the hall so as not to disturb him or his music. We joined the Romping Stompers in Oxnard, California and held every office in the club and were presidents twice. I retired after 42 years as an Administration or Therapeutic Dietician and moved to Utah where I met Julie Goldberg. We took many trips to Salt Lake City to dance with the Single Swingers and Leather and Lace. I met Gene Etherington at the Guys and Gals and eventually we joined the Mavericks. We hugged hundreds of corners and found friends with the Mavericks and were vice president and president for 3 years. So we'll "Spin and Exchange Gears" because we enjoy the workout for the brain and the physical exercise from head to toe. Thanks for going down memory lane with me. Muriel Elaine Mann was one of a kind. She was strong, loving, compassionate, giving, and charitable. She followed the example of Jesus Christ. Her father was a carpenter. He built many homes in the Denver area, some close to where they lived, including a house on 1411 South Franklin Street. They settled into that home when she was just a few days old. Her father also built the house next door, which they moved into when it was finished. She lived there until she married in 1952. Elaine originally thought that she would like to attend the University of Colorado in Boulder, but her father said no, that University of Denver was really close, and living home would be less expensive. She met her husband in a Zoology class and announced their engagement at a Sorority dinner. She graduated 1949 in Dietetics. Elaine applied for an internship and was accepted at Miami Valley Hospital in Dayton, Ohio. During her residency her father died, and she made the trip home for a week and then returned again to Dayton. She was one of eight interns and lived in a two story house on the hospital grounds. Her roommate was the only one that had a car and would take the eight of them around. She remembers having a lot of fun together. One Sunday she went to a near-by church when not scheduled for duty. The minister spoke about his vacation in the Colorado Mountains and made her so homesick, she cried. Elaine was married June 8, 1952 to Gayward Neal Mann at Washington Park Community Church. Gay later attended law school, and they relocated to Virginia for his employment. It was in Washington DC where their daughter Linda was born. Eventually, they returned to Denver for a short time, but then Gay accepted a position at Point Mugu Naval Base in California. So they moved to Ventura and found an apartment at the Buenaventura Gardens Apartment complex. It was nice being close to the Ventura mall and to the local grade School. She writes that Linda really enjoyed the swimming pool, but not too long after that they moved to a home on 872 Colina Vista where she lived for 35 years. Elaine loved square dancing and participated in clubs faithfully since she was a young woman at the University of Denver. She square danced regularly and liked it very much. Elaine tells the story that when they lived in Denver, she persuaded Gay to learn how to Square Dance. She convinced him to go to a potluck Square Dance activity at the church where they were married. He went even though he said square dancing didn’t interest him and only attended to satisfy her. She promised Gay that they would go home after the potluck, but once the caller got them all into a large circle and taught some basic steps then put them in squares, Gay had the time of his life and could hardly wait until the following September to take lessons. They danced weekly or more and were favorites in their square dance clubs. They enjoyed square dancing all over California. They joined a square dance club in Oxnard called the Romping Stompers and held all the offices in the club. They instigated many parties, picnics, and many other activities with the club. Following Gay’s death in 1972, Elaine continued to dance faithfully in various square dance groups in California and later with the Guys and Gals, then the Mavericks in Utah. She square danced for nearly 68 years. Elaine supported her daughter in every way. She took Linda and her friends to Osmond concerts as often as Linda could convince her to make the trip to Las Vegas or down to LA, and it happened frequently. She and Linda are best of friends and they travelled together to Hawaii, Washington DC, Disneyland, and many other destinations. At the visitors center of the LDS church she signed the guest book and the next she knew a couple months later, 2 missionaries came knocking on her door, and they asked her how she liked Hawaii. And of course Linda was there and said “Let them in.” She knew who they were as she had seen them on the street. So that was the beginning of their lessons with the missionaries. Linda wanted to join the church and be baptized. Elaine was not sure and insisted Linda complete the confirmation class at the Church of the Foothills, which she did but persisted in joining the Mormon Church. So Elaine gave in and Linda was baptized at 15-years-of-age. Elaine followed shortly thereafter and was baptized and confirmed a member of The Church of Jesus Christ of Latter-day Saints in January 1980. Later, she was sealed to her husband for time-and-all-eternity in the Los Angeles temple. Family has always been of upmost importance to her. Elaine worked as a dietician for 42 years, 20 at the Camarillo State Hospital. Retiring in 1992, she relocated to Orem to be near her family once again. We saw her frequently and had Sunday dinners at her home nearly every week. She made friends in her new neighborhood, ward, square dancing groups, and among family acquaintances. Elaine answered to many names, but “Gma” was her favorite, and ours. We enjoyed having her over to dinner and a visit at our house frequently in recent years. Gma’s hobbies include scrapbooking, square dancing, travelling, genealogy, temple work, and family. Elaine spent many years serving in the Mount Timpanogos Temple. We expect that she has helped dozens perhaps hundreds of people on both sides of the veil. Now that her ill health is no longer a barrier, she will no doubt continue her service on the other side of the veil. After more than 46 years, Elaine has been reunited with her sweetheart Gayward. They spent many happy years together and are now finally back with each other. Certainly their reunion was sweet. A few years ago now, Elaine sat down at the computer, which normally intimidated her, and she composed her journal and shared some life experiences: 18-single-spaced typed pages. Because of that, we can cherish this memoir and her memory. Her charm and character are manifest throughout its pages. Her memories and anecdotes are fun to both read and share, though just a glimpse into the life of this special woman, mother, grandmother, and friend-to-all. Elaine was a jewel of a person and always wanted what was best for everybody—friends, family, acquaintances, and absolutely everyone she met. Many knew and loved Elaine and a few lucky ones had a turn in the square-dance-of-life with her. We consider ourselves some of the most fortunate.